In 2010, my wife and I began our Face of America project. In phase one, we traveled the length and breadth of the continental United States searching for examples of the Face of America on its best day. We drove more than 30,000 miles. We recorded more than 110 hours of video footage. We took 57,000 digital pictures, and we interviewed 400 people all in the span of about 100 days. During the years that followed, we continued our search for examples of America At Its Best. In our opinion, the Face of America belongs to people who give service to others by doing acts of kindness that give people hope and a belief that tomorrow can and will be better than today. The face of America belongs to people who want to give something of themselves to their country, their community and their world, people who never let adversity define who they are. As we approach the seventh anniversary of our final project, we found a classic example of America At Its Best at the John Heinz Institute of Rehabilitation just 11 miles from our home. This word cloud is our attempt to capture the spirit of this very special place and the people who work there. The classic definition of thoughtfulness is showing consideration for the needs of others. Thoughtfulness is the hallmark of every person who works at the John Heinz Institute in Wilkes-Barre, PA. Every day, the therapists and members of the staff work with people who are experiencing great challenges. They become a bridge of hope for the patients they serve, their caregivers and family members. That bridge is deeply rooted in thoughtfulness. My wife and I have been in the medical system for several years. We have experienced the challenges that come with a diagnosis heart disease and breast cancer. Recently, I was diagnosed with Parkinson’s disease. All three of these health problems have reinforced a basic fact of life. Before you can completely heal the patient, your actions and words must convince them that you care about them and their situation. At the John Heinz Institute they never underestimate the power of a touch, a smile, a kind word, a listening ear, an honest compliment, or the smallest act of caring, because they know all of these qualities have the potential to turn a life around. Competence is the ability to do something well. Obscurity and a competence-that is the life that is best worth living. These thirteen words written by an American genius were designed to highlight two important points. It’s not about fame. It’s about doing your best. The people who offer their services at the John Heinz Institute are not interested in acclaim. They are interested in positive outcomes for their patients. Thank you, Flo Kohar for conducting the Video Swallow Test in a competent and caring way. Researchers at the Greater Good Science Center at the University of California, Berkeley define compassion as “suffering together.” Compassionate people identify with the suffering of others. They actually feel the pain of the person who is struggling with a medical challenge. During his tenure, the Chief Executive Officer of the Stony Brook University Hospital in New York, Dr. Steven L. Strongwater, made it very clear that compassionate care is integral to the art of healing. Collaboration among patients, family members, and providers occurs in policy and program development and professional education, as well as the delivery of care. Accommodating people are eager to help someone with a problem. They do it in a friendly way. Salvador Minuchin is a respected family therapist. He called accommodation one of the silent songs of life without which life is impossible. Sylvia Boorstein teaches at Spirit Rock Meditation Center in Woodacre, California. She believes that accommodation is a gratifying choice. According to Dr. Minuchin, the the road to accommodation is paved with tolerance, support, and flexibility. These are fundamental family values. It should come as no surprise that all the members of the John Heinz family go out of their way to accommodate the patients, family members and caregivers who depend upon the services and programs offered at the center. Thank You, Theresa Yaron for all that you do to accommodate the needs of patients. When I think about encouragement, the image that always comes to mind is the iconic World War II image of Rosie the Riveter flexing her muscles under the slogan “We can do it.” It’s all there. Just being in the Heinz Rehabilitation Center is a transformational experience. In my two months of rehab, I have met more heroines and heroes than I have seen in a lifetime. They are young and old, rich and poor. They represent a variety of ethnic and racial backgrounds, but they all have one thing in common. They have hope that they can improve their circumstance. Working with their therapist, they are determined to give their best effort to overcome the challenges they face. They want to walk again, speak again, and work again. They want to have a normal life again. There is genuine sense of community in this life-changing place. On September 20, 2013, my wife and I attended a Town Hall Forum at the Medal of Honor Convention in Gettysburg. We were there to produce a documentary about the convention. 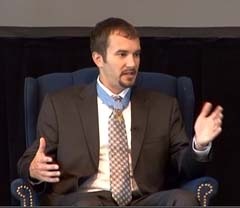 Approximately 300 attended the Town Hall Forum, and one of the most memorable moments happened when Medal of Honor recipient Sal Giunta was asked why he did what he did and what was going through his mind when he did it. Giunta surprised everyone in the room with his answer. I did what I did because everyone else was doing the same thing. There’s no room or time to think about you, because you don’t matter. We matter, and it has nothing to do with you as an individual. I never once led. I always stood side by side to my brothers. My first thought was to my boys…. I will never forget that moment and those words. In my mind, they constitute one of the best definitions of selfless humility and service I have ever heard. Fast forward three years and two months, and I am watching Sal Giunta’s words play out in a totally different setting. There are no video production crews or journalists. There is room filled with therapists and their patients. Every one of them was doing the same thing. They were standing side by side with their patients, offering encouragement and hope. Their first thought and all the thoughts that followed were about helping their patients. If you want to find powerful examples of goodness and humility visit the John Heinz Rehabilitation Center. There are no cold, proud people there. A heartfelt person is a sincere person. John O’Donohue believes that a loving heart awakens the spirit to possibilities and engagement with others. That’s the spirit I experience every time I enter the John Heinz Institute. To be honest, I try to arrive 15 minutes early for my appointment so I can sit in the waiting area and experience the heartfelt engagement between the patients and their therapists. It is polite, earnest and professional. Dr. Martin Seligman is the father of Positive Psychology He believes that a pleasant manner is the first step on the road to success. 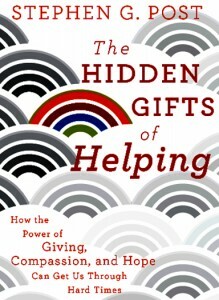 He is founder of the Positive Psychology Center at the University of Pennsylvania. His research uncovered five elements for a happy life: Positive Emotion, Engagement, Positive Relationships, Meaning and Accomplishment /Achievement. I can honestly say that I experience all of the elements of Dr. Seligman’s PERMA model at the John Heinz Rehabilitation Center. They use their strengths and virtues in the service of something much larger than who they are. Thank you, Mark Miller for making the effort to welcome in a polite and friendly way every patient and family member who visits the John Heinz Institute in Wilkes-Barre. Your kind words and actions make the rehabilitation center something that I look forward to every week. Kindness is a human value that is action-oriented. A kind person wants to help people who are suffering. Dr. Stephen G. Post is a professor of Preventative Medicine at Stony Brook University. He is the director of the Center for Medical Humanities, Compassionate Care and Bioethics. He is the author of Why Good Things Happen To Good People and The Hidden Gifts of Helping. When he was asked to provide characteristics that are central to America on its best day, Dr. Post was quick to respond with six qualities: gratitude, hope, joy, compassion, generosity and loving kindness, a concept that is deeply rooted in the Mussar tradition. I believe the spirit of kindness permeates everything that happens at the Heinz Institute. All of the members of the staff want to help the patients they encounter. My speech therapist, Joanne Orlando, is always looking for ways to resolve my problem. She reflects the light and the spirit of kindness. If I were an artist painting a portrait of the people who staff the John Heinz Rehabilitation Institute, their faces would radiate vivid images of hope, love, joy, faith, courage, creativity, community, and nobility of purpose. Thank you to all the men and women who work at the John Heinz Institute of Rehabilitation. You are America at its very best. of American History in Washington, D.C.